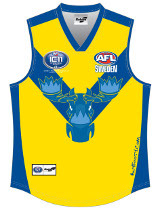 The Sweden Elks this year return for their second IC, after finishing 12th on debut in 2008. Captained by Johan Lantz and coached by Daniel McClaer, at the IC11 the Elks will be hoping to break out of the "middle field" of nations who are well ahead of the minnows, but yet to prove they are able to challenge the powerhouse nations at the front of the field. 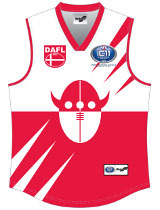 Swedish footy had its roots with the Helsinborg Saints, who were formed in 1996 to compete in the Danish Australian Football League, just over the water in Denmark. The southern region clubs continue to compete in the DAFL, with the Saints today joined by the Port Malmö Maulers, both clubs supported by a Scanian Local League. With just a few days to go before IC11 we thought we'd flashback to the most controversial moment in International Cup history. South Africa, regarded by some as the AFL's favoured nation, trailed Ireland by 5 points in the playoff for 3rd, with just seconds to go in the match. A controversial free kick was paid but the South African was almost certainly too far out to score the needed goal. The siren sounded and he was forced to kick to win the match... as he ran in... well there are 2 versions. The Irish say he ran around the mark, thus play on, game over. The umpire said the Irishman on the mark moved over the mark first, thus a 25 metre penalty. The result was a shot at goal from much closer in, a straight kick and joy for the Africans and bitter anger for Ireland. The AFL released video of the incident which they said supported the umpires decision. This author saw it live at the ground and first instinct was umpire error. Watching the video many times I felt it was just too difficult to really know one way or the other. Is this now the greatest rivalry in international footy? Will the two nations cross paths again in 2011? Sadly the Papua New Guinea team has been struck by tragedy on the eve of their International Cup defence. Scott Reid, the Chairman of AFL PNG Ltd has informed us that Peter Meli, the Team Manager and a member of the 2002 International Cup side and father of current player David Meli, was killed in Port Moresby after a send off function for the Mosquitoes squad on Saturday night. The incident occurred where he and several PNG players and staff were held up and Peter was stabbed and died in hospital later that night. Walter Yangomina, the National Manager Development was with Peter at the hospital. Peter was dropping off PNG players after a send off BBQ for IC2011. His son David Meli is a scholarship list player with Essendon and was expected to star for PNG at the upcoming Cup. It's a shocking thing for the PNG footy community. It's early days but the thought is to award the Peter Meli medal to the best PNG Mosquito of the Cup, and that the medal will commemorate Peter by being awarded at every International Cup in future. I'm sure the entire international footy community join with us in passing on their sincere condolences to the PNG camp and especially the Meli family. 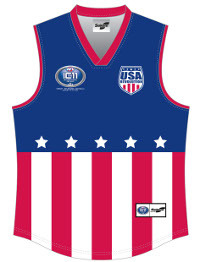 The US national team, the American Revolution or "Revos" as they are affectionately known, are heading to Australia to take on the best teams in the world in the Australian Football International Cup. In 2008 they finished seventh; back in 2005 the Revos finished a very respectable third after beating 2002 winners, Ireland twice. With the top nations powering ahead in their footy programs, can the Revos wind back the clock and capture a top four spot? Up against fast opposition they've selected for speed whilst still fielding an experienced side, in part due to the demographics of footy in the US. The Denmark Vikings are back for their third IC campaign this year, after strong showings in 2002 and 2008. The Danes have one of international footy's longest history of matches, and have generally fielded a strong team, but so far haven't been able to challenge the top flight sides like PNG and NZ. With a fit and relatively young side, the Vikings will be eager to show that this year they can hold it with the best of the field. 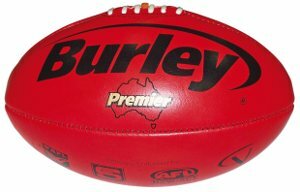 Entries close for the worldfootynews.com IC11 Tipping Competition at 10:00pm Australian Eastern Standard Time (12pm GMT) this Wednesday 9th August. Contestants that have already entered should receive an email later today asking for their tips for Game Day 1 (Saturday August 13th). If you do not receive that email today then please contact us. Tips will be due in by 9am AEST on each Game Day. For a bit of extra incentive we've organised a couple of great prizes from Burley Sekem. Top spot will receive a Premier football (pictured left, recommended retail price AUD$109.95) and second spot gets a Match football. IC11 Preview - Can Timor-Leste's Crocs show some Bite on Debut? One of a number of debutants at this year's IC will be the Timor-Leste Crocs, representing one of Australia's closest neighbours and Asia's youngest independent nation. 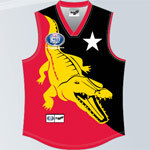 The Crocs were founded only three years ago, but have since formed the AFL Timor-Leste and become a regular appearance in the Asian tournament circuit, as well as maintaining a domestic comp in and around the capital city Dili. Footy had an on-again-off-again presence in Timor-Leste (also known as East Timor) since the late 1990s, but the current setup dates back to 2007, when Australian peacekeeping forces and aid workers formed a social footy club known as the East Dili Eels. From the Eels in 2008 grew the national team, christened the East Timor Crocs, who made their international debut at the Bali 9s Masters that year. On the domestic scene, the AFLTL counts local teams representing both Australian military and development personnel, as well as local Timorese military and civilians, and players from other countries resident in Dili. Games are generally 9 to 11-a-side. Since the U16 national squad, the Kurakums, first showed the world they could play by finishing 3rd at the Queensland State U16 Youth Girls, female football has developed considerably in Papua New Guinea. Long known for their strong Youth Girls players, today PNG also has its own senior women’s leagues and they are excited to be able to put a women’s team, the Flame, into this year’s International Cup Women’s Division. The men’s team, the Mosquitoes, have done considerable well in the International Cup and now the women of PNG will have the same experience competing at international level. With confidence and experience from playing on par with Queensland’s best, the team is confident that like their male counterparts, they are the best in the world. 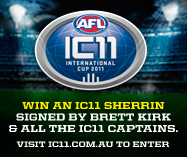 The AFL are running a competition to win an official IC11 Sherrin football signed by former Sydney Swans Captain and IC11 Ambassador, Brett Kirk and all 23 IC11 team captains. They are also giving away five double passes to each of the IC11 curtain raiser games: St Kilda V Swans game in Sydney or Hawthorn v Bulldogs game at the MCG. What do you have to do to win? 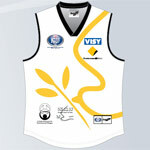 Go the competition page on the AFL website, and vote for your favourite team guernsey and tell them why it is your favourite in 25 words or less. It might not capture the world's imagination quite like being invited into the Oval Office at the United State's White House, but a visit to the Australian Prime Minister's Sydney residence, Kirribilli House, is still a special invitation. That's what some of the International Cup combatants will experience on the morning of Tuesday 15th August. Each nation has been invited to nominate two representatives to attend Morning Tea at Kirribilli House on the morning of IC11 Game Day 2. No word yet as to who the guests will meet, but both Prime Minister Julia Gillard and her partner Tim Mathieson are very serious footy fans. Note that the Prime Minister's official residence is The Lodge in Australia's capital Canberra, but Kirribilli House also commands a special regard given Sydney's status as Australia's financial capital and largest city and is often used for official receptions. The Peace Team are returning down under for the IC11, again bringing a squad of Israelis and Palestinians to play footy and build bridges between the Jewish and Muslim communities. Coordinated by the Peres Centre for Peace, the team were a widely reported good news story in the Australian media during the 2008 tournament. The Peace Team faced a steep learning curve onfield at the IC08, finishing 13th overall in a field of 16. Five players from the 2008 tournament are back again this year, including Kamal Abu Althom, Yonatan Belik, Kfir Kol, Abed Abu Raduan and Naseem Almanasra. Another name in the squad which may be familiar to WFN readers is Doron Zauer, who is a long-term member of the "AFL in Israel" group which organises social footy in Jerusalem and Tel Aviv. The Timor-Leste (East Timor) Crocs will be making their IC debut this month, doubling as their debut in full-field international footy. Whilst the Crocs have been an increasingly regular competitor on the Asian footy circuit, this month will be the first time an all-Timorese team have played an international test match under IC eligibility rules. The Crocs will be playing for the pride of their relatively young nation, which only achieved its independence in 2002 after a long period as a Portuguese colony, followed by occupation by Indonesia. Timor-Leste now has numerous connections to Australia, including the security forces helping rebuild the country's political structures and infrastructure. Although the Crocs are somewhat of an unknown quantity, on paper it looks like their main weakness may be a lack of height, with their tallest player standing only 178cm - 5 foot 10 in the old scale. One key squad member could be vice-captain Carlos Britto, described by the AFL Timor-Leste as probably the only Timorese citizen to have played representative rugby, and also having playing experience in the AFL Sydney.